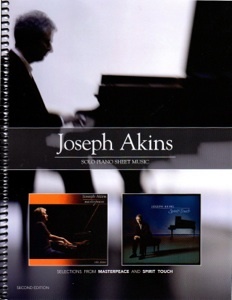 The second edition of Joseph Akins’ exceptional Solo Piano Sheet Music book has some significant “upgrades” from the first edition (2011). The most important difference is the addition of two songs: “Finding Grace” from Masterpeace and “Dance of My Ancestors” from Spirit Touch, bringing the number of pieces to twelve. The covers have been modified a bit and the four pages of performance notes have been updated to include the new pieces. The new edition is also spiral-bound and the notation is crisp and easy to read, making this book a welcome addition to any piano sheet music collection. The song titles include six pieces from each of Joseph’s first two solo piano albums, Masterpeace (2007) and Spirit Touch (2009). All of the pieces were transcribed by Joseph Akins except “Feeling Joy,” which was transcribed by the excellent Rebecca Oswald. These are note-for-note transcriptions, as faithful to the recordings as possible. Akins’ performance notes include the inspiration behind the music and suggestions for playing the improvised passages - invaluable tools! 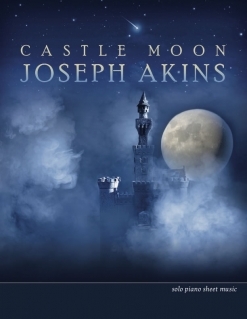 Joseph Akins is a very accomplished pianist, so although the pieces are not overly difficult, some contain tricky timing and move all over the piano. I would say that most of the pieces are at an early-advanced playing level, although a less-experienced pianist who really wants to learn the music should be able to do so successfully. The key signatures are not complicated and although there are quite a few octave chords, there are no reaches of more than an octave. Chord charts are included and expression is clearly-marked. 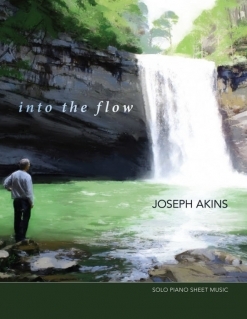 All twelve pieces are fun to play, so if you are a pianist who loves Joseph Akins’ music, this book is a must! 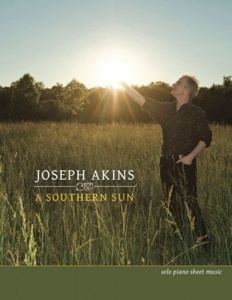 It is available from josephakins.com and I highly recommend it!